The beaches were close and great. The town is amazing. I ONLY recommend the areas - not these apartments. Good apartment with all the commodities that were announced. Wifi and cable tv and a balcony with view to swiming pool and sea. A lot of restaurants and parking near by. A return visit for us, great place, hope to go back again next year, lovely staff. Amazing view from the balcony, beautiful, clean beach just outside the door. Friendly staff, we were served outside of their working hours. Very close to some very good restaurants. Plenty of parking spaces on the street. Nice pool to cool down. The friendly helpful staff.The view from the room. Lock in a great price for Apartamentos Carteia – rated 8.2 by recent guests! The spacious apartments are simply decorated and contain a lounge with a sofa bed, cable TV and balcony. The fully equipped kitchen has a refrigerator, stove, microwave and oven. The bathrooms feature a bath tub. There are many outdoor activities on offer in the area including fishing, hiking and cycling. The tour desk can help organize excursions and can arrange bicycle and car rental. Guests can also choose to relax on the sun terrace by the pool. Private parking is available upon request at the Carteia Apartments, and Faro International Airport is only a 30-minute drive away. Vilamoura and the Oceânico Pinhal Golf Course are less than 2.5 mi away. This is our guests' favorite part of Quarteira, according to independent reviews. 뀐 Located in the top-rated area in Quarteira, this property has an excellent location score of 9.3! When would you like to stay at Apartamentos Carteia? This apartment contains a bedroom and a lounge area with a sofa bed. It has a fully equipped kitchen and a balcony with views of the Atlantic Ocean. This apartment contains 2 bedrooms and a lounge area with a sofa bed. It has a fully equipped kitchen and a balcony with partial views of the Atlantic Ocean. This apartment contains 3 bedrooms and a lounge area with a sofa bed. It has a fully equipped kitchen and a balcony with partial views of the Atlantic Ocean. This studio contains a bedroom with a seating area and a fully equipped kitchen. It has a balcony with partial views of the Atlantic Ocean and the pool. This studio contains a bedroom with a seating area and a fully equipped kitchen. It has a balcony with partial views of the Atlantic Ocean. This apartment contains a bedroom and a lounge area with a sofa bed. It has a fully equipped kitchen and a balcony with partial views of the Atlantic Ocean. This apartment contains 2 bedrooms and a lounge area with a sofa bed. It has a fully equipped kitchen and a balcony with extensive views of the Atlantic Ocean. Situated on the beachfront eastern side of Quarteira, completely renovated with modern urban facilities. Carteia Apartments provides you a pleasant and memorable stay in the Algarve. 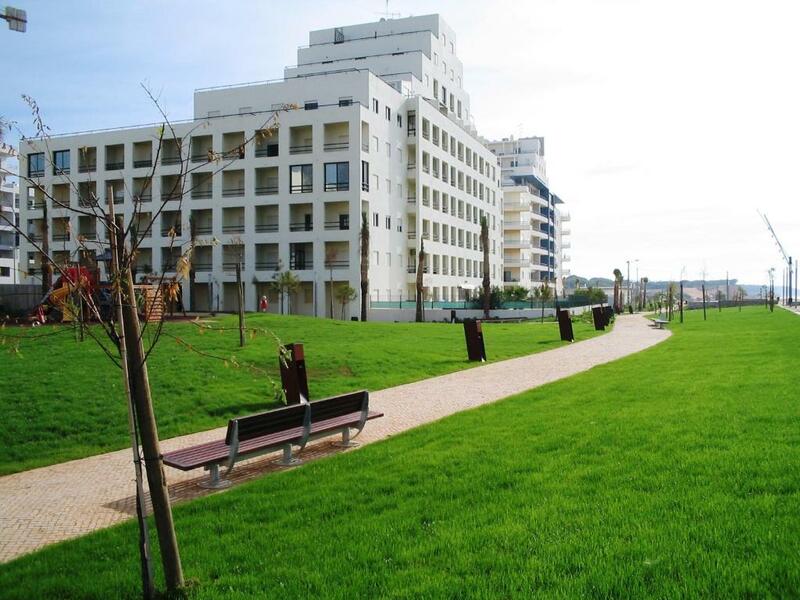 House Rules Apartamentos Carteia takes special requests – add in the next step! Apartamentos Carteia accepts these cards and reserves the right to temporarily hold an amount prior to arrival. Please inform Apartamentos Carteia of your expected arrival time in advance. You can use the Special Requests box when booking, or contact the property directly using the contact details in your confirmation. Unfortunately being on the corner of the building the noise of the wind howled through he walls all night.The Electrics were faulty causing one plug to catch on fire. Cleaning and towel change only provided every 3 days. On late arrival we were short for sheets. Went to the reception in the morning and asked for sheets for all people and i was told that cleaner is going to drop them into our room. When we went back in the evening there was no sheets and reception was closed for christmas, so we were left without sheets for 3 days. Lovely location, metres from the beach. In the apartment you have anything you would need, supermarket in a walking distance. Many restaurants around. Apartment clean and well maintained. Play ground nearby. Would definitely recommend. If I'm being picky - the beds were a little hard. This place is located right beside the sea, supermarket is a 5 min walk, bars, cafes, promenade are very close. We stayed in a spacious 2 bed/2 bath apt with everything you'd need. We loved this place. Staff were very friendly. The apartment is close to the beach and at the end of the boulevard, teh beach is just a few steps from the building. Enough space in the appartment, kitchen has all basic equipment, fridge, stove, micro wave, even a washing machine. In october enough parking space in neighbourhood. With elderly people the boulevard is perfect, every 30 m a place to sit down and enjoy the view. Beautiful beach and lots of restaurants on the boulevard. Lidl and Continente just 3 km away. Energy socket problem and the oven. The furniture a bit old needs to be updated. The view is unbelievable. The staff really helpful and easy going. Pool could have been a touch warmer. There were dozens and dozens of small dogs being walked (toileted) on the beach and the grass play areas. Very large apartment with modern, fully equipped kitchen. Very clean bathroom with multi function shower. Huge flat screen TV. Apartments only 100m from the beach. All in all, truly excellent.